Online Learning and Outreach Librarian Gr Keer and Health Sciences and Scholarly Communication Librarian, Lana Mariko Wood, (California State University, East Bay) kicked off their symposium presentation with a nod to the 2016 theme, Money and Power, saying it directly inspired their research topic, Peer Review: Problems of Power. The tenure track colleagues, who had discussed the “promises, problems, and pitfalls” of publishing and the peer review process, sought to survey experiences of other academic librarians involved in or teaching about peer review. The topic was framed by examining a variety of aspects of the process, using the framework to align questions of authority, such as who gets authority or access to authority to be a peer reviewer, as well its voluntary nature and lack of compensation. The study focused on current peer review instruction and how personal feelings or experience of instructors might influence them to contextualize when teaching students about peer review. These questions directly correlate to a number of information literacy concepts, such as; evaluating information, scholarship as a conversation, and authority being contextual. Keer noted that although peer review has been in practice since the 1600’s, the current model has been rather brief, stretching back only to the 1970’s and warrants review. Indeed although a review of the literature during their ongoing project yielded data on issues in information literacy instruction, discussions of the publishing industry,( including open access and fraud), faculty status/tenure, and critical assessment of research, it was noted that most discussions of peer review are outside of the library world and are “not prevalent among us”. Keer and Wood’s mixed-method survey study was disseminated through academic library listservs and social media within the United States and Canada between August and September 2016. The survey yielded 202 eligible responses from the field. All survey participants were also invited to schedule an interview, but only 25 elected to do so. Demographically, over 50% of respondents were in the library profession 0 – 10 years, with the remainder being equally split between the 11-20 and 20+ year categories. A majority of those surveyed were from doctoral and graduate degree granting institutions, and 47% of surveyed librarians were not tenured or tenure-track. The survey reflected that 97.5 %, of academic librarians taught about peer review in the past 12 months, with 73.8% participating in the peer review process either as author, editor, or reviewer. Over 100% are teaching peer review as one shots or stand-alone classes to first or second year students. Study findings yielded a range of responses to queries regarding the definition and function of peer review, such as “authority or quality control”, “standards”, “accuracy”, or “ensuring quality”. In response to context of peer review, the majority felt that it falls under “scholarly knowledge production” and “discussion of the publishing industry”. Some replied that they do not contextualize, but include peer view in discussions of popular vs. scholarly content. 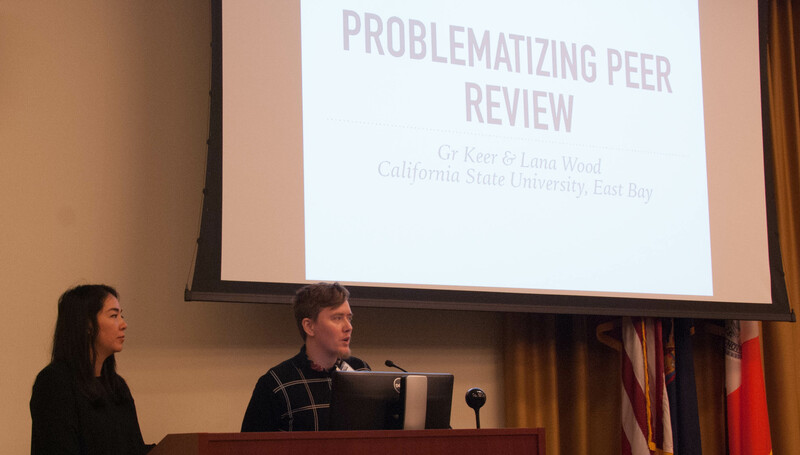 There were those who felt teaching about peer review should be limited to third or fourth year students, however, Wood countered many at CSU are first generation or non-traditional college students and drop out after the first year. “How do we bring peer review into the curriculum earlier to give them skills for lifelong learning?” Others agreed that is important to introduce peer review as a process, and point out the pitfalls as well. It is not a gold standard or guarantee of quality—checking off the “peer review box” in a database search might bring you a great article or only a book review. It is a matter of discernment. How is the origin of the source related to the article topic–authority is contextual. External influences affecting the tracking of peer review included faculty demands (56%), followed by information literacy instruction, and the ACRL framework. Although some experienced conflict with faculty in teaching peer review, many received positive feedback about the framework (Authority is constructed, information has value, information as a process, and scholarship as a conversation). Some were also compelled to bring in their own personal experiences (both good and bad) when they felt it was appropriate, such as ways in which power can be reflected in systems of peer review, i.e. a peer reviewer insisting that male co-authors be listed before females. Open or collaborative peer review models received the most positive comments, offering a superior level of interaction and opportunity for more rigorous writing. In summary, Keer and Wood concluded that most librarians teach peer review but with a wide variety of approaches, and the decision to teach it depends on course instructor and time constraints. They are thinking about the framework, but not consistently or specifically connected to peer review. While contextualizing does occur, it is seen to be best taught at a higher level. Before wrapping up the presentation, symposium attendees were also asked to share how they would ideally contextualize peer review with students in a ten-minute break out session, spawning a lively Q & A discussion. Gr Keer and Lana Wood ended their discussion with next steps to ponder: “What are best practices in teaching and contextualizing scholarly peer review in IL instruction?”, “Should we as a profession move to open peer review as the norm in our publications?”, which offers us all an opportunity to add to the conversation of this timely topic. Elaine Provenzano is the Assessment and Marketing Librarian at Manhattanville College. She serves on the ACRLNY Symposium Committee and on the Executive Board as Editor of the ACRLNY Connections newsletter. Elaine has an MSLIS with a concentration in Rare Books and Special Collections from the Palmer School at Long Island University; an MA in Liberal Studies from Manhattanville College; and a BS from SUNY Empire State College. This entry was posted in 2016Symp and tagged 2016 Symposium by Derek Stadler. Bookmark the permalink.